Admission to LAAS is open to all students likely to benefit from our programme. We welcome applicants from our local community and the international community. Applications for admission are accepted and reviewed throughout the year on a rolling basis. A clear procedure allows parents to take their decision based on a firm understanding of our admission process. 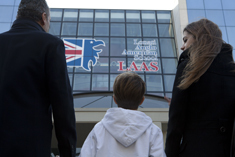 Becoming a part of the LAAS family is simple enough with our easy admission procedure. A personal visit and tour of our facilities prior to registration can acquaint you with LAAS and is recommended. A student may be admitted to the school at any time during the school year, at the discretion of the Principal, in tandem with the school’s review process and according to availability. • Submission of the LAAS application and the following documents: Enrollment form, annual subscription fee (€500,00), copies of student’s school reports for the previous two years (if applicable), confidential teacher questionnaire (faxed or e-mailed) from student’s current school (if applicable), reports of the results of special academic or psychological assessments (if applicable). • Review process of the application is conducted by the Principal, in association with other education professionals, as appropriate. The school prefers that students interact with peers of their own level of academic maturity and intellectual development. As a general rule, a student’s age group is considered for student admission and grade placement. This includes all students born within a designated calendar year (01 Jan. – 31 Dec.) not within a scholastic year. Additionally, for purposes of academic skills assessment, students are required to complete an entrance test prior to admission. An appointment for testing can be arranged through the school office.